Casa De Artista is an elegant as well as soulful estate built by local craftsmen with heart, spirit and great attention to detail. 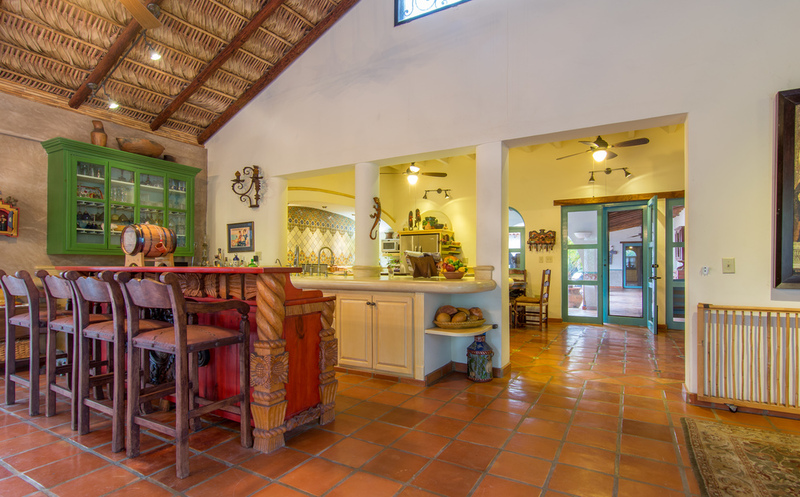 Each room offers its own unique magic, including hand painted murals, high beam ceilings, polished Saltillo tile floors and fine quality fixtures, finishes & appliances. The generous gourmet kitchen opens into a large entertaining and dining area including a large family style table, wet bar and relaxed seating for 20 people. The cozy den presents a wood burning fireplace and a wonderful couch perfect for reading or watching your favorite film. TV service is supported by the DSL data line, and works well with iTunes and Slingbox. Other internet based TV services can be provisioned. All rooms open onto a classic Mexican hacienda style veranda and central courtyard with fountain & sitting areas. The office includes high speed internet (6Mbps-DSL) with a Telmex hard phone line, dial phone service & has coverage for Telcel mobile phone service. The laundry room includes a Maytag Neptune series washer and dryer, and storage for cleaning supplies. The abundant exterior stone terraces feature many gathering and sitting areas, each with its own charm. You and your guests will enjoy the outdoor dining patio complete with a massive, hand crafted wooden dining table beneath a flowering ramada. After eating everyone can while away the evening sipping margaritas and chatting by the fireplace. The panoramic rooftop terrace presents views of the Sierra de La Laguna Mountains, Pacific Ocean and farmland. The GUEST HOUSE (800 sf) includes a full bath, kitchenette and sitting terrace. The property also includes an organic vegetable garden, many fruit trees, an RV pad with full hookup, two garages with parking for 4 cars and ample lockable storage spaces. Also included are two 2500-liter water holding tanks (one for municipal water and one for agricultural water) so that all water pressure is controlled locally. And for electrical emergencies you have a Cummins 20KW generator with automatic transfer switch and a 250 gal propane tank. Two more 250 gallon tanks supply the rest of the house’s needs. The property is fenced & gated and includes agricultural (canal on the property) water rights.